On a recent trip to the Grand Canyon, my son and I decided to do a little hiking. 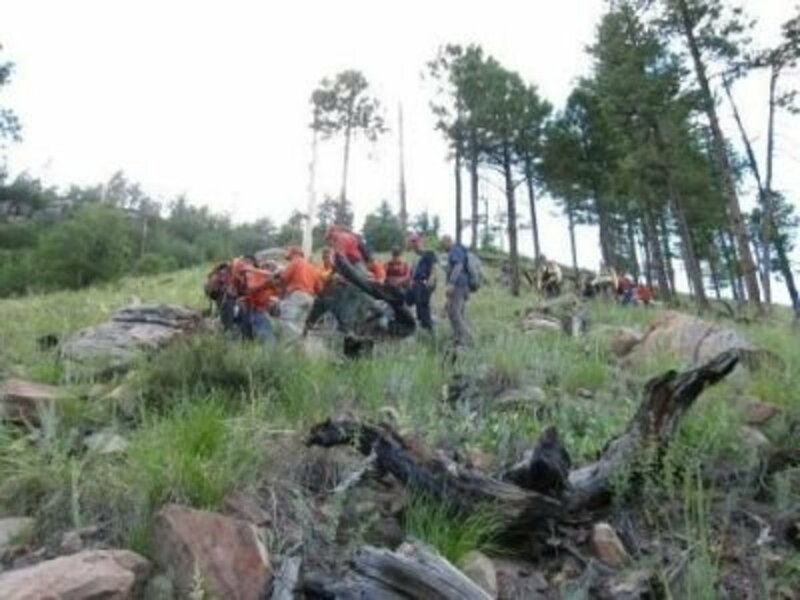 It is not recommended that hikers even attempt to hike to the bottom and back in one day. Since we did not have reservations at Phantom Ranch or or come with camping equipment, we could only do a day hike. I wanted a hike that would give us a good Grand Canyon hiking experience, that would be challenging, but one that could be accomplished in a reasonable amount of time before the heat of the afternoon. A hike to 1.5 mile Resthouse (3 miles round trip) would not be very challenging and a trip to Indian Garden (9 miles round trip) would be too much. We settled on a hike to 3 mile Resthouse (6 miles round trip). It seemed like a nice hike and a good challenge for us. 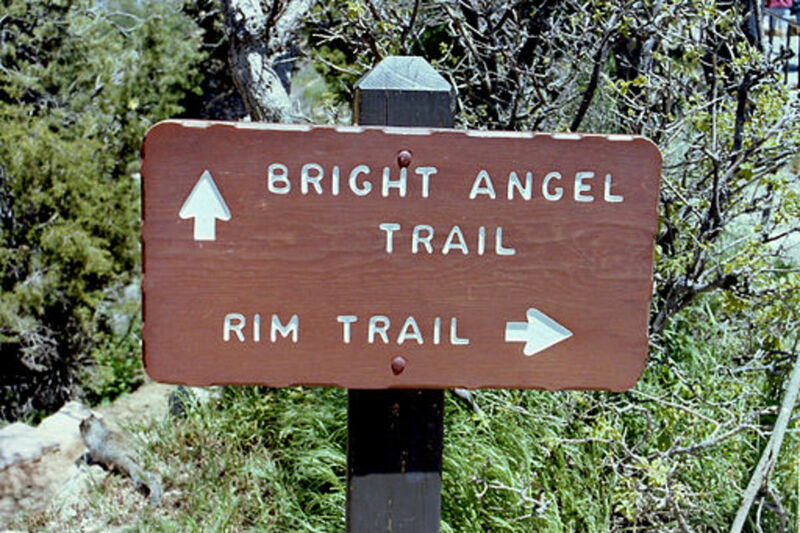 The 2 most commonly hiked trails, other than the Rim Trail, are Bright Angel Trail and South Kaibab Trail. Both are corridor trails meaning that they are maintained as well as patrolled by park rangers. 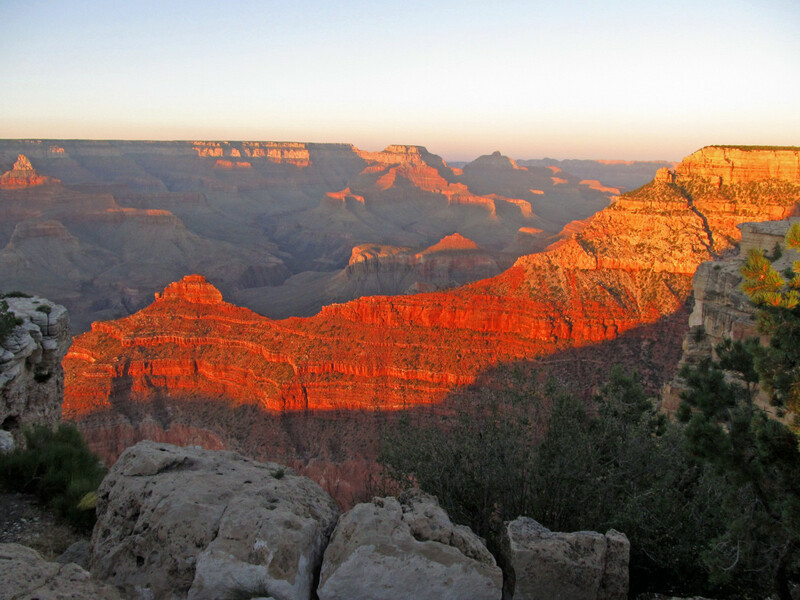 Hikers to the bottom of the Grand Canyon and Phantom Ranch or a campground often hike down South Kaibab Trail. 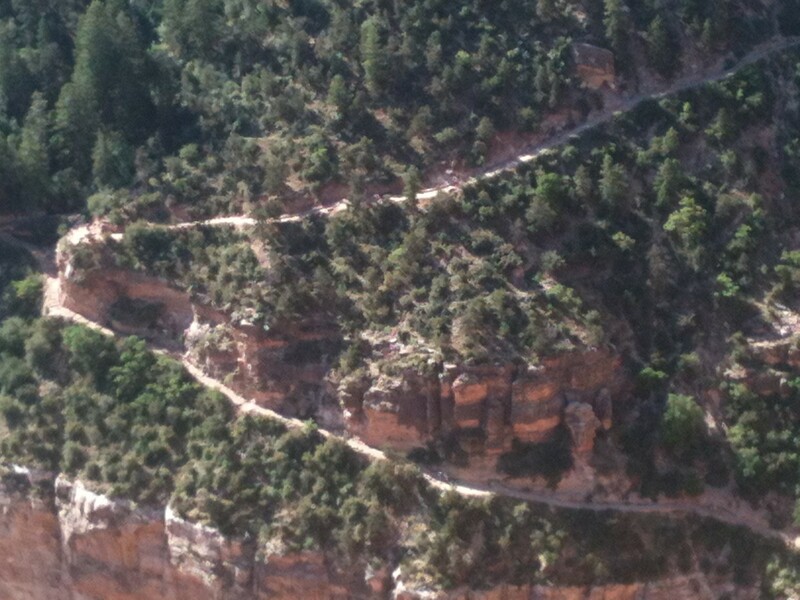 After a night or more in the canyon, they return to the South Rim by hiking up Bright Angel Trail. 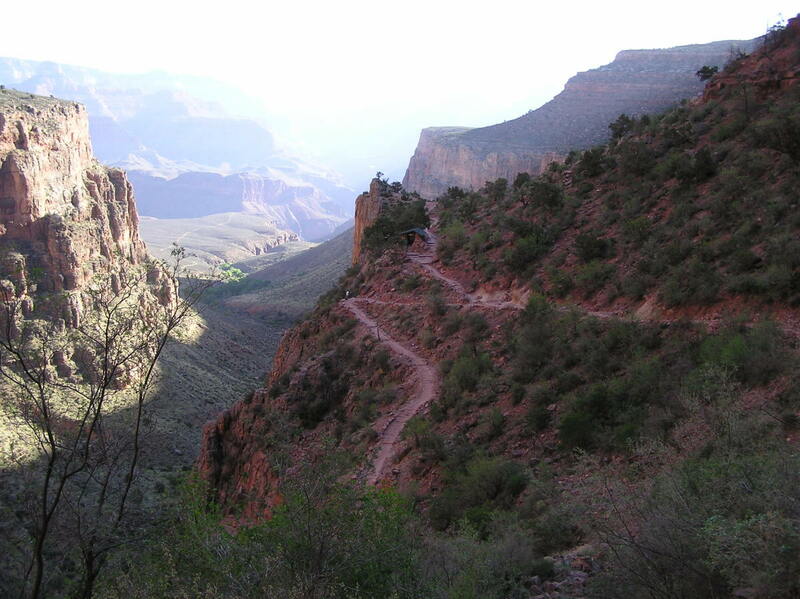 South Kaibab Trail follows a ridge line, is steeper than Bright Angel Trail, and has no shade and no water available on it. 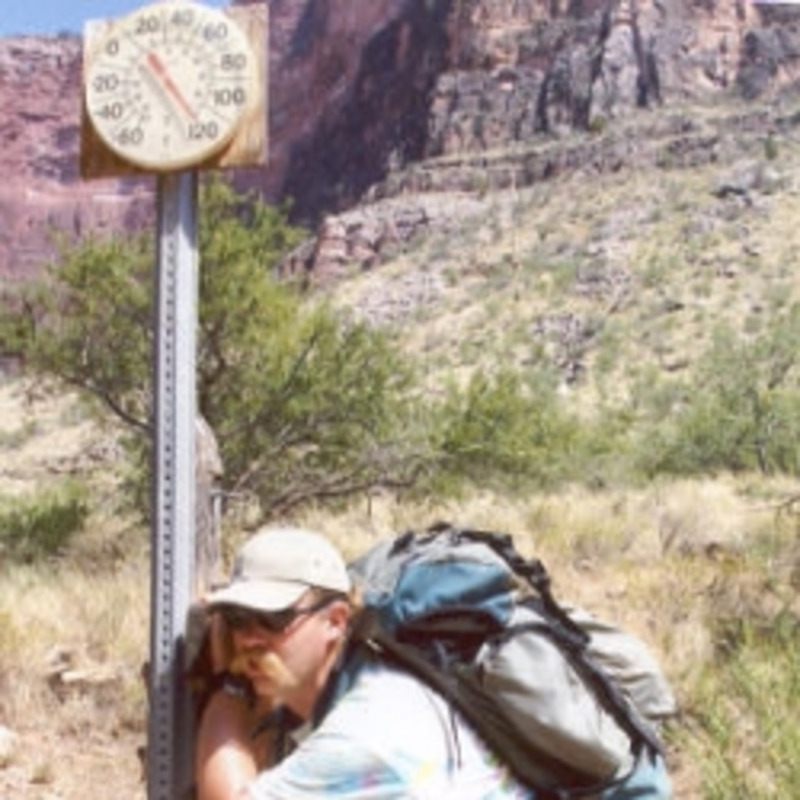 Since hiking down is usually easier than hiking up and the trip down is shorter than the trip up, hikers can carry enough water for the trip down South Kaibab Trail. 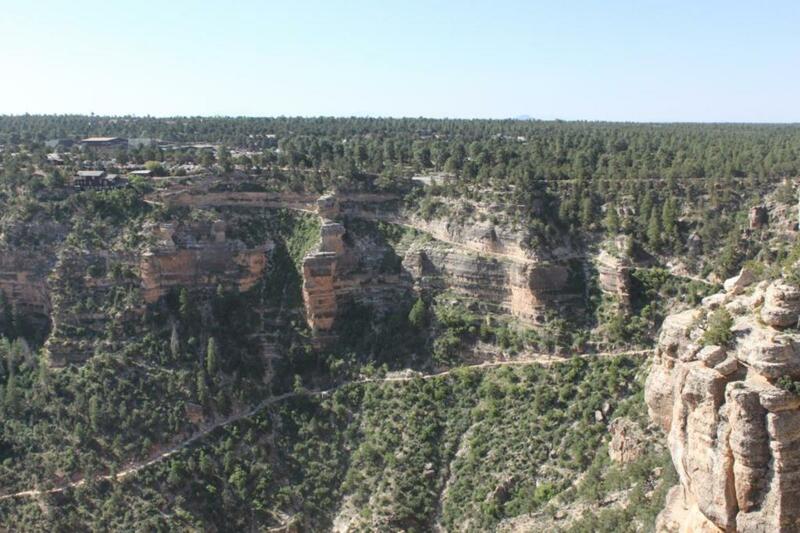 With summer temperatures regularly above 110°F (and up to 130°F), a vertical climb of 4,380 feet coursing over 9.5 miles, and over 200 heat related canyon rescues a year, Backpacker Magazine ranks Bright Angel Trail as one of America's 10 Most Dangerous Hikes. Hikers that underestimate the difficulty of the hike, are poorly prepared, hike in the middle of the day (hottest temperatures), hike too far down, and do not carry enough (sometimes no) water all contribute to this assessment. The section from the canyon bottom to Indian Garden (particularly the Devil's Corkscrew) is considered to be the most dangerous because of the higher temperatures in the canyon compared to those at the rim. 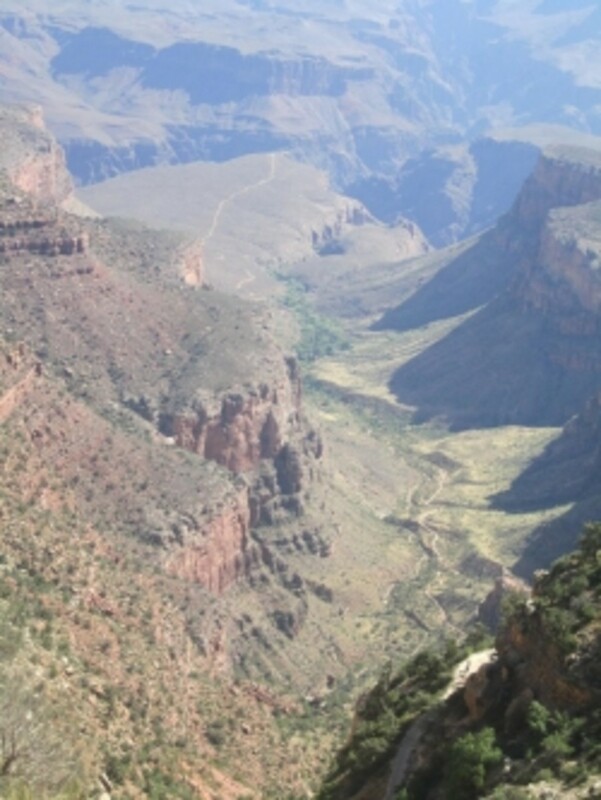 But, Bright Angel Trail, with good maintenance, occasional shade, resthouses, water sources, emergency phones, ranger stations and a ranger presence, is one of the safest trails to hike in the Grand Canyon. Located at the head of a secondary canyon, Bright Angel Trail follows the Bright Angel Fault as it descends down between two massive cliffs. Throughout your hike you continuously experience different views; different perspectives of the canyon that remains below you and the cliffs rising up above you. The original trail was blazed centuries ago by Native Americans to get to the water in the area now known as Indian Garden. In the late 1800's prospectors used the trail to reach mining claims. By 1903, Ralph Cameron realized that by staking mining claims he could gain control of the trail, not for mining purposes, but for commercial uses. He would charge tourists a $1 toll to allow them to hike to Indian Gardens where he had planted Cottonwood trees that remain today. Not to be out done, the railroads developed trails in the Hermit's Rest area and the National Park Service created South Kaibab Trail. 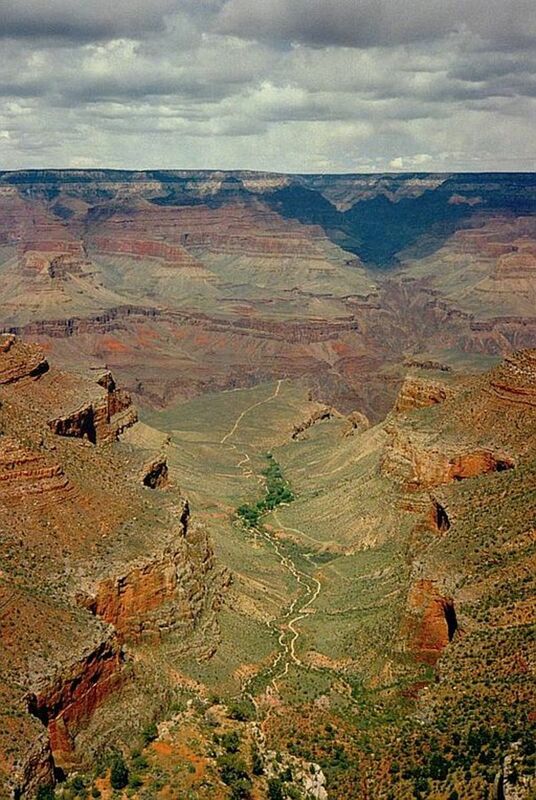 After numerous legal battles, Cameron's Bright Angel Trail was turned over to the NPS in 1928. 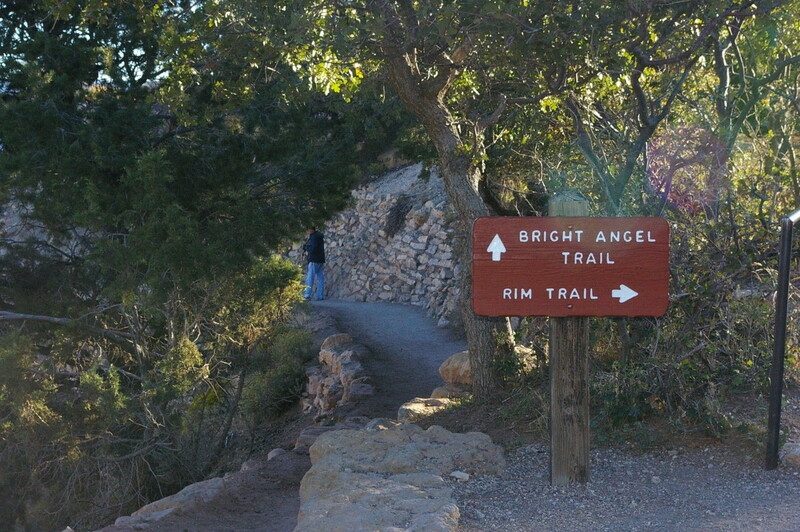 Despite rerouting and improvements over the years, Bright Angel Trail still approximates the route used by the Native Americans ages ago. 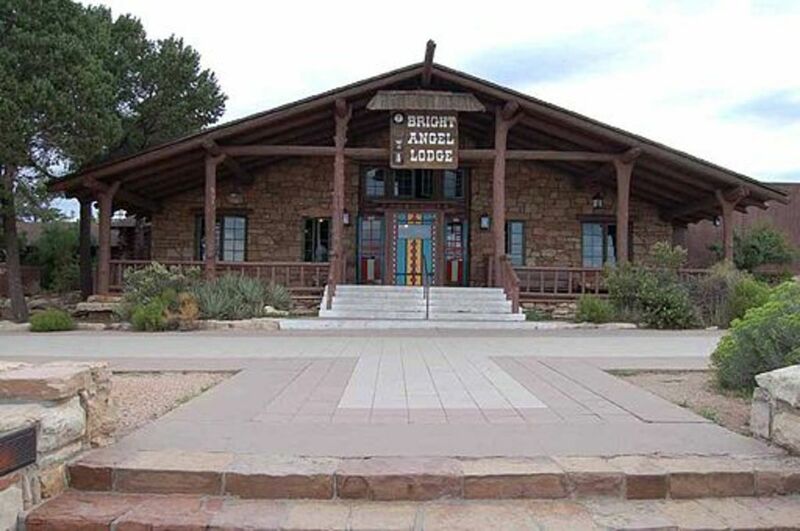 The trailhead is located just west of Bright Angel Lodge, Lookout and Kolb studios. Fresh water is available at the trailhead so fill up before you start. 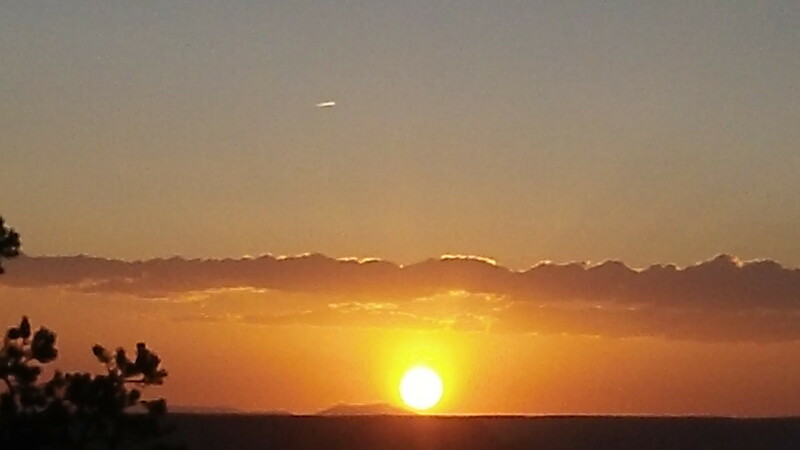 The recommendation is to hike early in the day before the sun gets too hot or go in the late afternoon as the sun is going down. We didn't get the early, sunrise start that I had hoped for. On the day we hiked, the sun rose about 5:30AM but we didn't hit the trailhead until 6:45AM. The trail starts downhill immediately, gently at first. It is well maintained with a little bit of a sandy covering. In general, the footing is good, but there are some areas with rocks. Between the trailhead and 1.5 Mile Resthouse there are 2 tunnels. In less than a quarter mile from the trailhead we reached the first tunnel. This is a nice spot to get a view from within the canyon or to turn around if you are more tourist than hiker. Between the 2 tunnels, the trail becomes even steeper. It was here that a mule deer crossed in front of us blazing her own way down the canyon wall. At 3/4 of mile, we arrived at the second tunnel. By this point we'd already descended 470 feet. Compared to the rim, we had a completely different perspective of the canyon. With a significant portion of the canyon still below, we now had steep cliff walls rising up above us. By 7:30AM we had reached the 1.5 Mile Resthouse with fresh water, toilets and an emergency phone. For casual hikers 1.5 Mile Resthouse is a good place to turn around. If you are worried about the condition of the toilets, you needn't be. We couldn't use them. They were being cleaned! After a short break and a refill of our water bottles, we were on our way again. 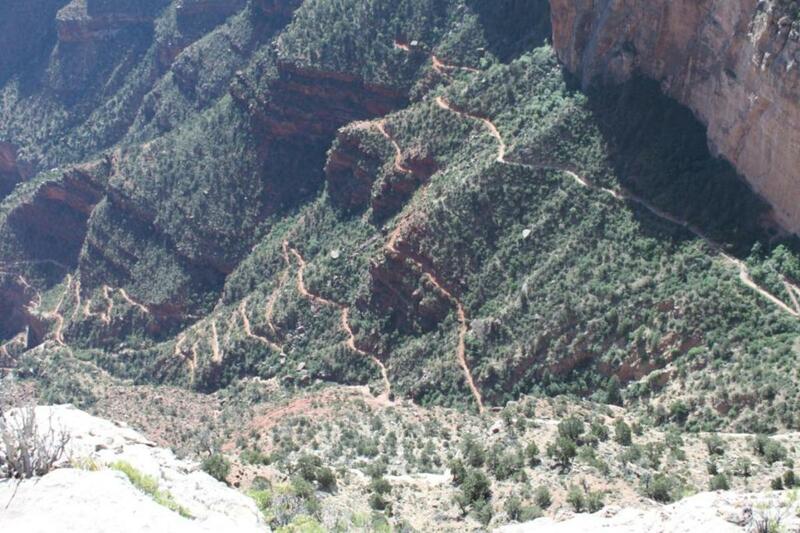 The trail seemed to get steeper as we progressed down the canyon. The switchbacks were more frequent. The mules continued their journey past us. Before 8:30AM, we had arrived at our turn around point, 3 Mile Resthouse. By this time, the trail was becoming quite congested. In addition to the day hikers, we encountered hikers coming up from the canyon floor as well as fresh hikers heading down to spend their time by the river. And there were the mules. 3 Mile Resthouse is a good place for day hikers to turn around and head back to the rim. Continuing down, the trail gets steeper before leveling out toward Indian Garden and Plateau Point. A very step portion of the trail, Jacob's Ladder, is just below 3 Mile Resthouse. Continuing to Indian Garden would have added an additional 1.5 miles (3 miles round trip) to the trip. But, more importantly, it would have added another 950 feet of elevation that we would have had to climb back up. While many references state that there are no toilets at 3 Mile Resthouse, I can assure you they are there. Trust me on this one. After a short rest and a refill of our water bottles we started the climb back up. Bright Angel Trail courses 9.5 miles from the South Rim to the Bright Angel Campground in the bottom of the canyon (with a 4380 ft change in elevation). The majority of the change in elevation occurs in the 4 miles of trail closest to the rim (much of it the portion we were hiking). As a rule of thumb, for every hour of hiking down, plan 2 hours to hike back out. For every hour of hiking up plan a 15 minute break. Every step down reminded us that we would have to take an equal and opposite one on our way back up. Not everyone on the trail was a hiker. I have already mentioned that mule deer and mules also use the trail. The mules are used to transport riders up and down the trail as well as to transport goods and materials along the trail. We encountered one group of mules with riders and 2 others with pouches for carrying supplies. One of the riderless groups was hauling material for trail repair. 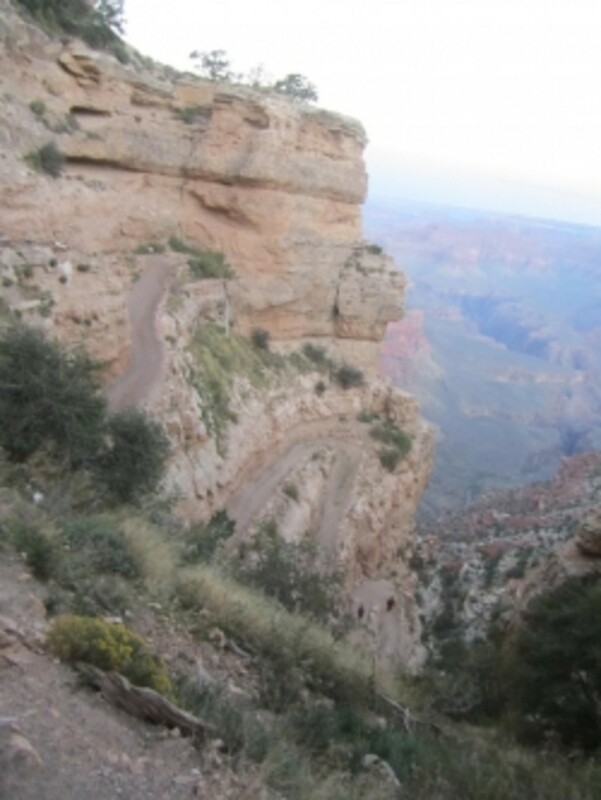 Road construction delays even on a trail in the Grand Canyon! We took it slow and easy on our way out, switchback after seemingly endless switchback. We took frequent breaks and drank plenty of water. We found shady areas to rest. Near the top and just before the first tunnel, we encountered a condor sitting on a rock about 10 feet from the trail(similar to the picture above). Was he looking for lunch, a hiker who over extended and couldn't get back or just enjoying the tourists? We reached the trail head about 11:15AM, tired, hot, and sore but, we had done it. We were back at the South Rim about 4.5 hours after we had left. We had traveled 6 miles, descended and then ascended 2112 feet. We had experienced the Grand Canyon from within. If you are like my son and I, you reach the South Rim hot, tired, but with a sense of accomplishment. You have just completed a very difficult hike. Time to reward yourself with a dip at The Fountain. No, not in the fountain, at The Fountain. The Fountain is an ice cream parlor at Bright Angel Lodge. What the heck, get a double dip. You deserve it. Don't hike in the heat of the day. Hike early in the morning or later in the afternoon. Leave before dawn for long hikes. Try to be done hiking by 10AM or find a place to rest, out of the sun, until later in the afternoon. It would be better to use a headlamp and hike in the dark, just before dawn or just after dusk, than to hike in the heat of the day. 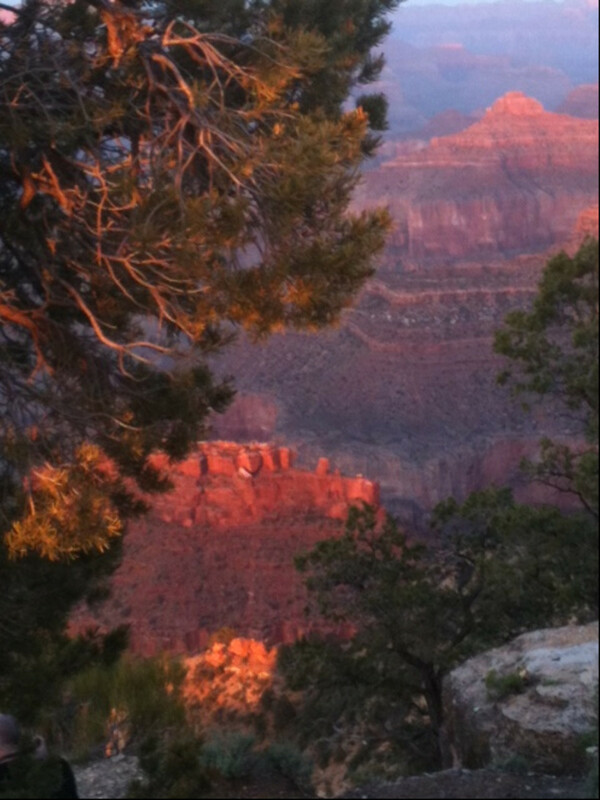 Many hikers from the bottom leave well before dawn to reach the South Rim before noon. In the colder months, use caution. 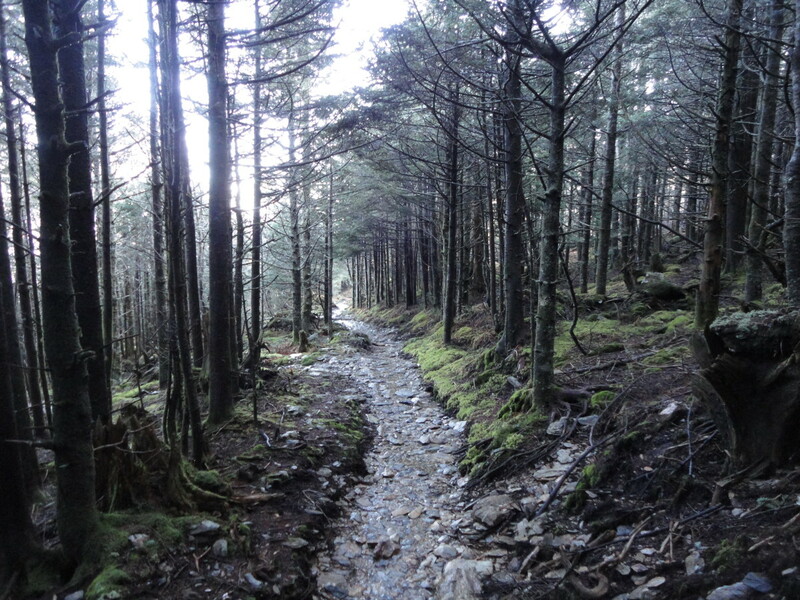 The upper part of the trail, if not covered with snow, could be very icy. Carry plenty of water. Even though there are sources of water along the trail, pipes can break making water unavailable where you may have expected it. Mules and uphill hikers have the right of way. Mules for your safety as well as the safety of the mules and their passengers. Right of way to uphill hikers as a courtesy. Sturdy hiking shoes and hiking poles seem to be appreciated by those who use them particularly for longer hikes. Don't walk and gawk. Step to the side of the trail if you would like to enjoy the view. 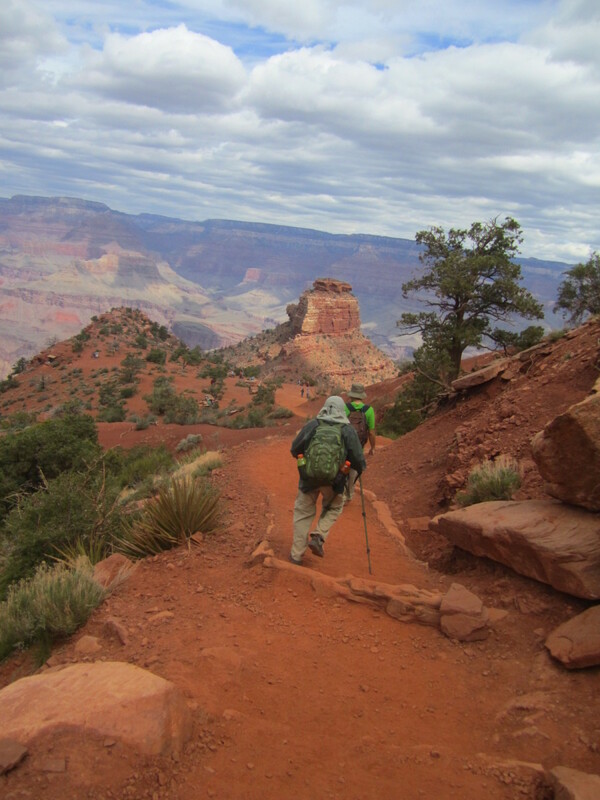 Outbound Dan has a great Hub on day hiking, Ten Tips for Safe Hiking: How to Prepare for a Day Hike, that is appropriate for longer hikes on Bright Angel Trail. Words cannot adequately describe the Grand Canyon. Pictures do only a little better. 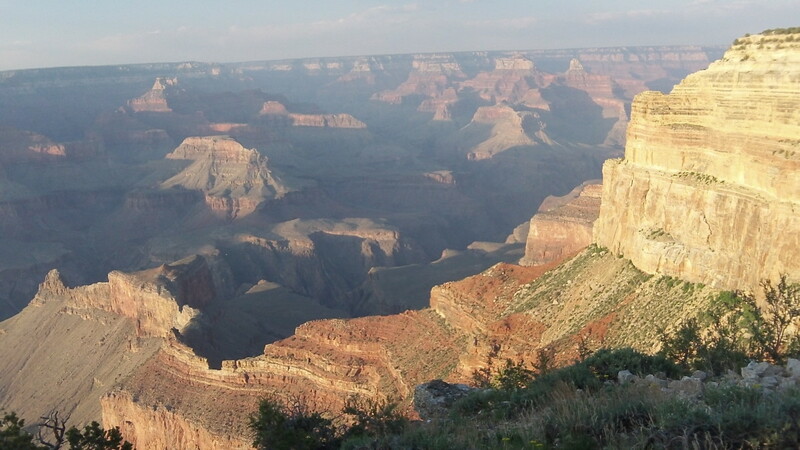 The Grand Canyon has to be experienced, felt, as well as seen. 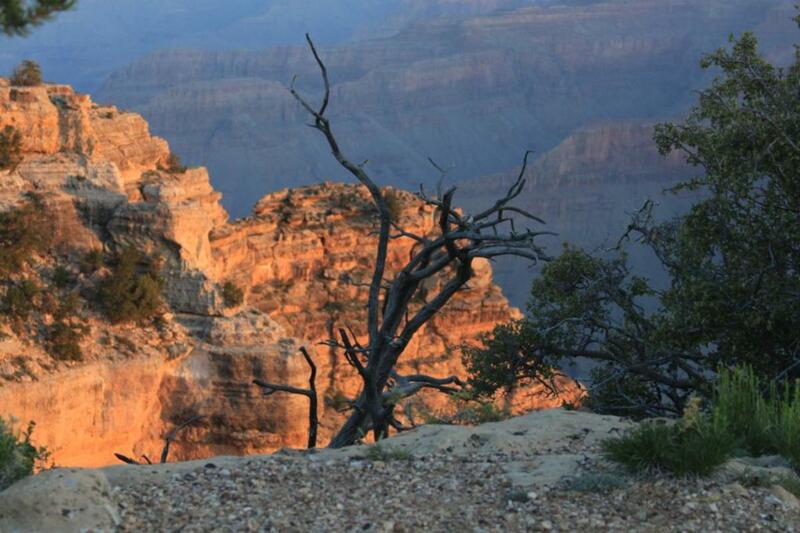 If you have never been to the Grand Canyon, you should add it to your bucket list. It is defintely one of the places you should see before you die. Here is a thumbnail album of more pictures to encourage you to plan a visit soon. Happy to share links with your Hubs. I look forward to reading more of your travel Hubs. Hope you make it someday! Perhaps you can find some other adventure loving soul to join you. Thanks for the link to my hub at the bottom of yours. Was so happy to have found this one to include in mine! Peggy W, thanks for the nice comments, the link, votes, and shares. My son, 24 years younger than me, said he was never going to get to the Phantom Ranch. He wouldn't ride a mule and the partial hike was enough for him to realize he didn't want to do the whole thing. Me, I see it as a challenge and hope to get to the bottom some day. It is on my bucket list. 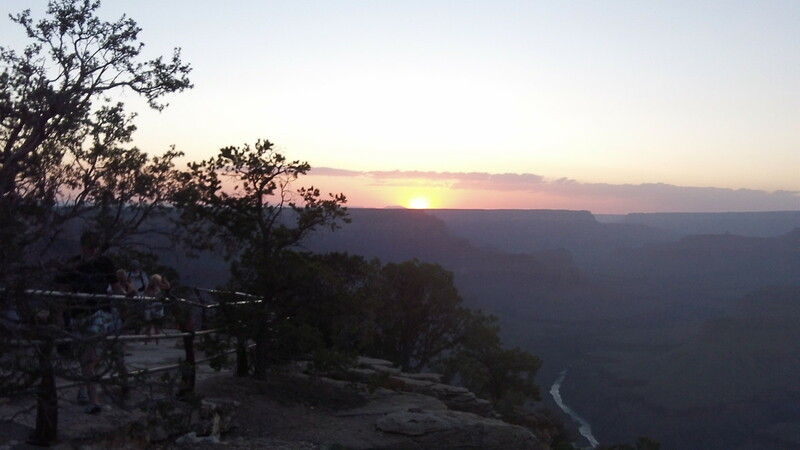 I really enjoyed reading about your experiences in hiking the Bright Angel Trail. I think my days of hiking such paths are long gone but it must be a fantastic experience. We have friends who took the mules down to Phantom Ranch. Had very sore behinds...but except for that, loved it. I took the liberty of adding a link from this hub to my latest titled The Grand Canyon + 2 Other Spectacular National Parks in Arizona. Will be a really nice addition! Up, useful, interesting votes and sharing. Stephanie, thanks for your comments, vote and share. 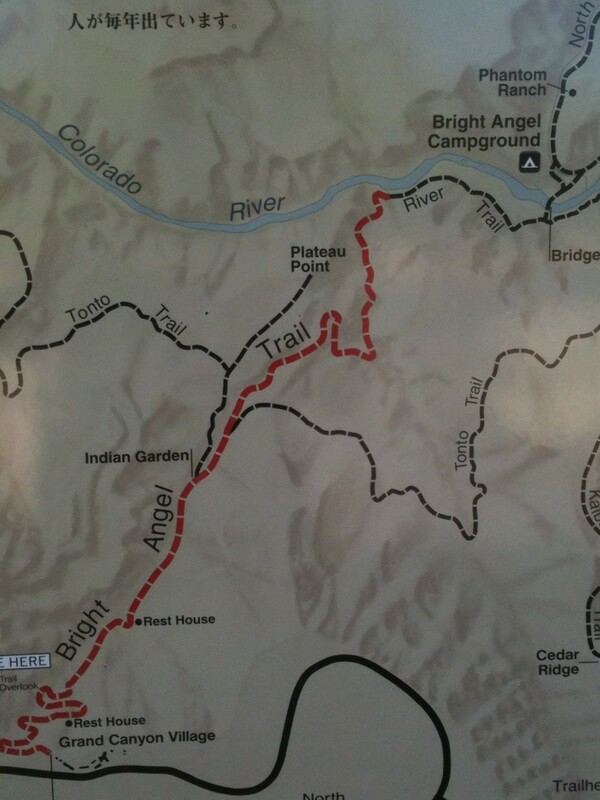 The great part about Bright Angel Trail is that almost everyone can hike it. You just limit how far you go. You can go about 1/3 of a mile round trip to the first tunnel and you get a whole different perspective of the Grand Canyon. 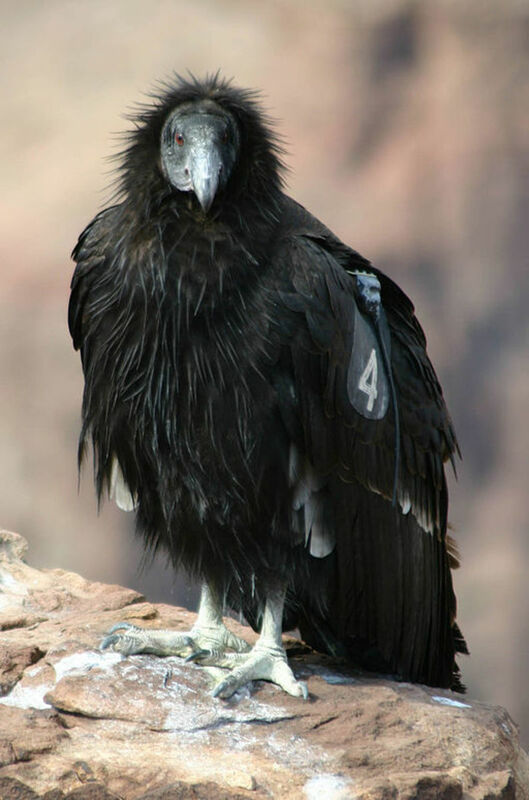 The condor we saw on a rock near the trail was just past the first tunnel. You don't have to go great distances to have a great experience. I think that this hike is beyond my capabilities, but I loved your hub, your great advice and the beautiful photographs of the Grand Canyon. It is a beautiful and fascinating place, and those who are able to do some of these challenging hikes will be well rewarded by fantastic scenery. Voted up and shared! moonlake, I'm glad you enjoyed my Hub. Never say never. Life can be strange. Maybe some day you'll get to see the Grand Canyon up close. GarnetBird, thanks for stopping by. 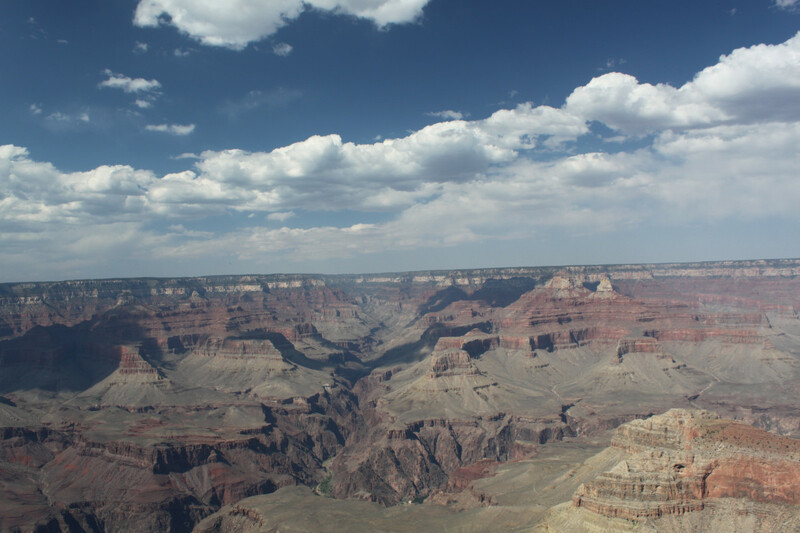 If you haven't been to the Grand Canyon, try to see it in person. I have heard that also. 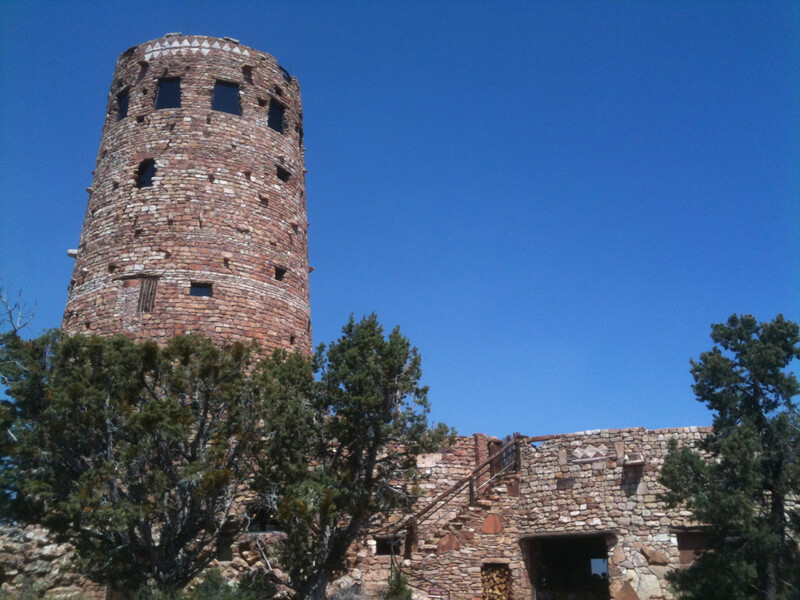 I think it is a little harder to get to the North Rim and a longer walk to the Phantom Ranch. I don't plan on hiking rim to rim. It's worth it! Next time I make the trip I want to check out the North Rim. I hear it's not as busy. brenda12lynette, glad you enjoyed the Hub. Some day I am going to get to Phantom Ranch (and back up). I've hiked from the bottom of the Grand Canyon up Bright Angel twice. Those switchbacks were almost the death of me both times! Great hub and pics! fpherj48, thank you for stopping by and the nice comments. The Grand Canyon is beyond description. Everyone should try to visit it at least once. Just walking down Bright Angel Trail less than 1/4 of a mile to the first tunnel is relatively easy and gives a completely different perspective of the canyon than what you get from the rim. I like to do these type of hikes every so often. Most of my hikes are shorter and easier, like a stroll. That was how the rest of our hikes in Arizona were (you can check out that hub). We try to go to interesting places when we hike. bankscottage.....This is what I call a real HIKE!! I have to admit, I call it "hiking" when I take a leisurely stroll into the woods behind us. You have experienced the real thing. The photos are just beautiful, not to mention how beneficial to one's health this sort of venture can be. I'm trying to imagine the hugeness of all this, but I'm sure it can only be understood and appreciated by being there. Excellent hub. I enjoyed reading this very much. After the hike my son said that there is no way he will ever be going to Phantom Ranch. 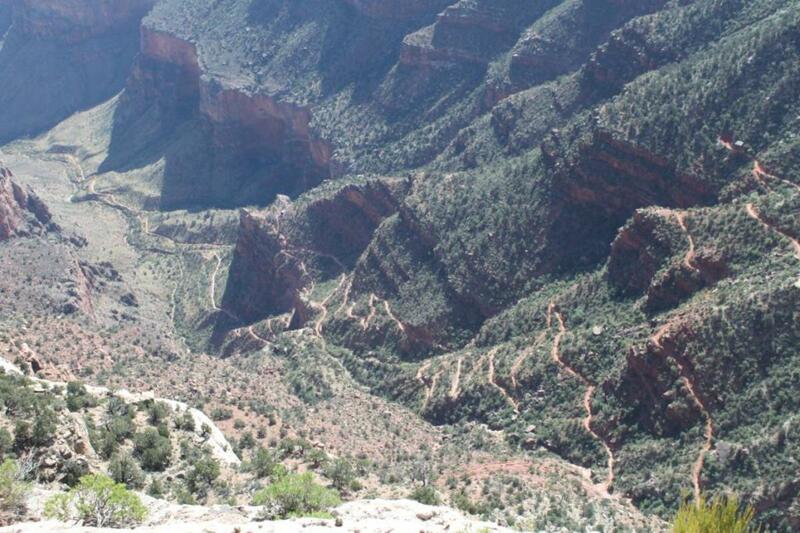 He said he had no interest in hiking the whole Bright Angel Trail, and after seeing the mules, said there was no way he would get on one of those. So, I'm looking for anyone else that would like to spend a night or 2 at Phantom Ranch. Your friend's experience points out how important all of your advice is. Even experienced hikers have to be careful. If you push the water but not the electrolytes you end up with water intoxication, very dangerous. The Grand Canyon is beyond description. 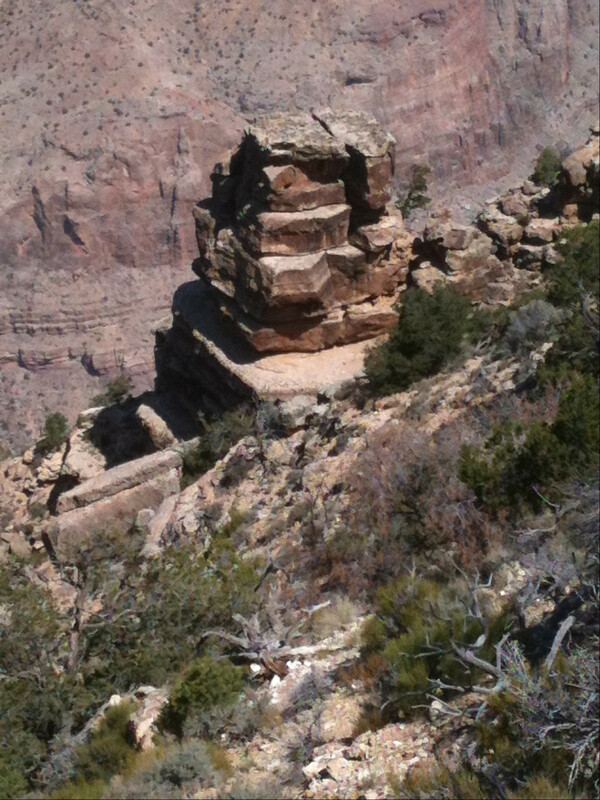 Someday I will get to the bottom and to the North Rim. Thanks for the nice comments and share. After a 2,000'+ climb you deserve a double dip. Wonderful guide with outstanding pictures. The Grand Canyon in on my bucket list, someday I'll make my way down there. A friend of mine, who is a very experienced hiker, ended up with severe electrolyte depletion while on an overnight trip on Bright Angel. 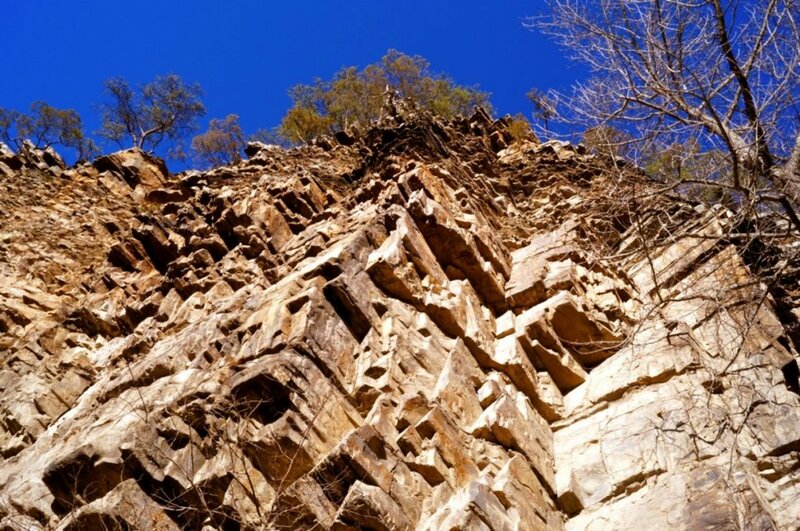 He made it out of the canyon on his own power, but needed medical attention at the top. As you cited, it can be a dangerous place. Of course, it looks like quite the beautiful place too. Oh, and thanks for the shout out - that is awesome. Totally sharing this!